No matter the time of year, life can be really busy. Lots of running in and out of the house without much time to plan for a meal. I love to cook and tend to be more inventive when it comes to recipes. Following them sometimes, improvising most of the time — especially if I don’t have the specific ingredients the recipe calls for. So, when Stonefire sent me some of their naan, flatbreads and crisps, I was excited to play around with the components. Stonefire Flatbreads come in a number of different sizes allowing you to create appetizers, pizzas and sandwiches. You will find original, whole wheat and garlic varieties. They are fully baked and ready for you to add your favorite toppings or ingredients. This seems to be quite advantageous when you have friends that pop over for a catch up visit and you want to offer a little snack along with your cocktails. The opportunities are endless when it comes to the add-ons from vegetables to unique cheeses to meats or switching from savory to sweet, doing thinly sliced green apples, brie and honey on a flatbread. Delicious! (and with very little effort). But don’t tell anyone! Here’s an example of a very simple but layered with flavor flatbread appetizer. Brush the naan or pizza crust with a thin layer of roasted garlic, fresh chopped basil, drizzle some olive oil and then top with a variety of white cheeses like fontina, mozzarella and parmesan. Put it under the broiler for just a few minutes and voila! I cut it into small triangles and served it with Prosecco cocktails. The first recipe I wanted to make was for a late night dinner. Knowing I had some grilled chicken from the night before, I played with the garlic Stonefire Naan adding the chicken, red onions, red peppers and a light layer of BBQ sauce on a flatbread and then covered in mozzarella cheese. Bake it for 8 minutes or so at 400 degrees. Bubbly melted cheese with a hint of tang from the BBQ sauce and sweet red onions. So good! This would be a fun family meal to make as well as each person can have their own naan to create their own masterpiece of flavors. Marinara sauce, pesto, olive oil, marscpone cheese and brie are just a few of the bases you can use on your flatbreads. Be creative. 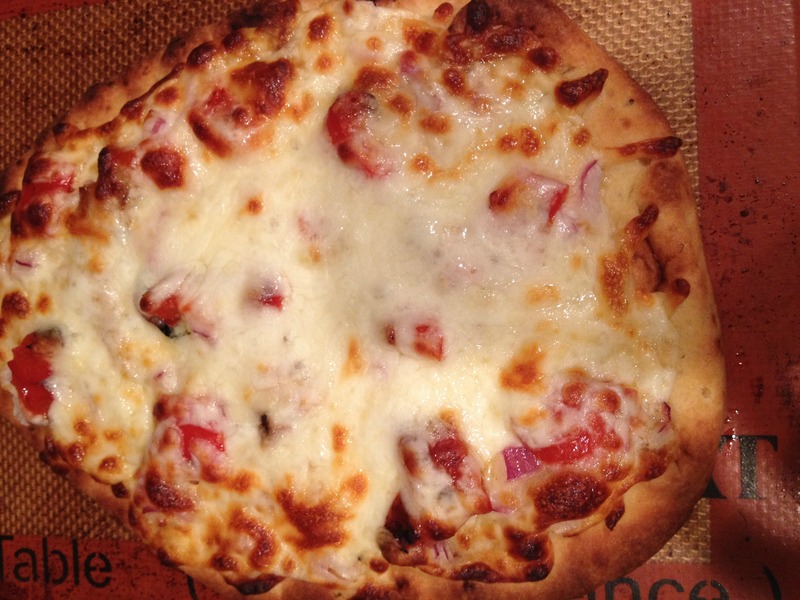 There is no wrong way to use Stonefire flatbreads. You can find Stonefire Flatbreads at your local grocery stores, delis and here. What’s your favorite way to use flatbreads and naan? Enjoy! This review was sponsored by Stonefire. Opinions and recipes are exclusively my own. Brush BBQ sauce over crust or naan as thick or thin as desired. Bake for 7-9 minutes till cheese is lightly brown and bubbly. Yummy! Thank you for sharing this delicious recipe! I’ll have to try it out. We love flatbreads at our house. We use them for everything from sandwiches to pizza. I even made a salad on top of a flatbread a few weeks ago and the kids loved it! Those flatbreads look really appetizing. It’s midnight here and I am feeling hungry! I love these flatbreads for pizza. They make dinner quick and yummy. I love using flatbreads. There are no limitations to what you can put on it. And they are great for a party night, each person can top their own. My favorite things in the world are pizza and bbq sauce, i cant even begin to tell you how much i love BBQ pizza! great post! thanks for sharing! That looks delicious! I love flatbread and pizza. Seems like it was all good including that humus, which I love too! Everything looks so delicious. I love popping a pizza in the oven when I have a busy day. Flat bread is my favorite! Flatbreads are amazing there are just so many things you can do with them. I love the idea of making a pizza out of them, the roasted garlic one sounds so good! I’d love to have a taste of that! The crisps are awesome as well, perfect with hummus and any dip you can think of! That looks so good and delicious! My family will love this! Thanks! This recipe sounds really yummy. Thanks for sharing this. Love it! Omg Naan bread pizza is amazing! I might have to try to make this for myself soon and they’re even better if you grill them on the BBQ! I haven’t tried flatbread pizzas although now that I live in Italy I have my choice of pizzas. Next time I make one myself though I might need to experience with this. I love their flatbreads so much. I buy them all the time, and use them in all kinds of ways. I love throwing them on the grill really quick for a bit of smokiness. It sounds delicious! Would love to have them in the fridge for a quick dinner! I really want to try Stonefire Flatbread BBQ Chicken Pizza. I’ve always wanted to try flatbread but I wasn’t sure how to use it or in what recipes to use it in. I can’t wait to try this recipe. YUM! I love flatbreads! This recipe sounds perfect for a work day dinner.